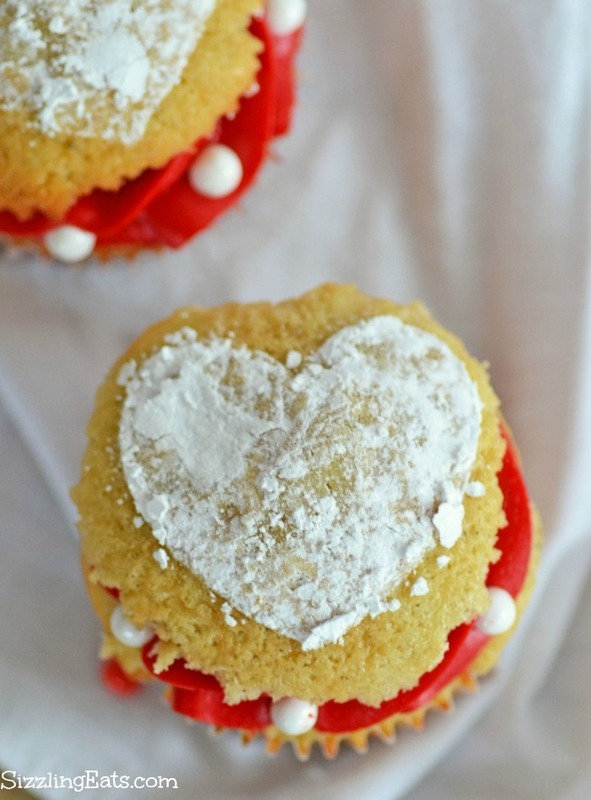 Home » Recipes » Dessert Recipes and Ideas » Heart Stencil Cupcakes-Perfect for Valentine’s Day! 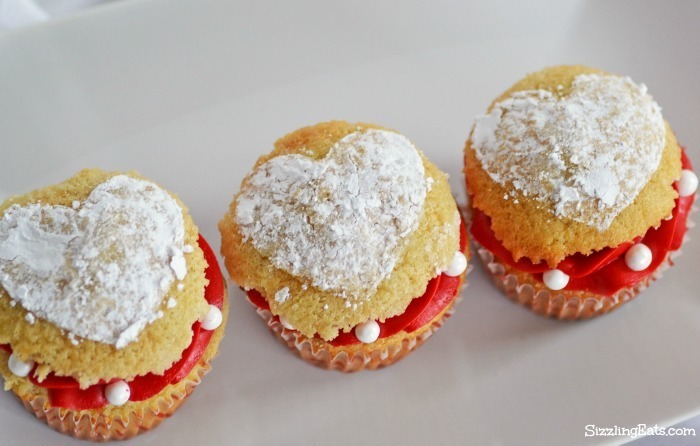 Heart Stencil Cupcakes-Perfect for Valentine’s Day! Oh how I love Valentine’s Day! Maybe it is the colorful pinks, reds, and purples? The pretty, and feminine hearts, or the fact that lovers have a their own day to celebrate? Regardless, it has always been a special day to me, and I do not even get showered with gifts–trust me! haha! I guess when it boils down to it, I just love the shape of a heart, and have so much fun decorating, and baking sweet treats like my heart stencil cupcakes with a peak of bright red frosting. I have always been such a fan of the simplicity and elegance powdered sugar can give baked treats like cupcakes, and even brownies. There is something just so tantalizing about a sprinkle of powdered sugar in lieu of traditional frosting. After buying a set of baking stencils, I knew I wanted to use the heart stencil for a Valentine recipe. Bright red frosting, some shiny, and shimmery pearls and a cute powdered sugar heart cupcake was what I envisioned. It was my first time splitting the top off cupcakes so besides that learning curve, I think they turned out amazing! For the red frosting color, I used Wilton Christmas Red Icing Color at a 1 teaspoon to 1 cup of butter cream ratio. The rest is easy peasy, and much more hassle free than I thought. They key to getting a nice sliced cupcake top is to actually fill the cupcake pan at least 3/4 of the way so that they tops are larger verses traditional half filled cups. It gives extra cake to work with verses pulling off the paper. Allow to fully cool before frosting, and slicing off the very tops. Cream your butter for one minute on medium speed. Adjust speed to low, and add your powdered sugar to your stand mixer and cream for an additional 1 minute on low speed. Add one teaspoon per cup of buttercream. Adjust color to your desired brightness. Pipe on frosting using a large star tip. Stencil powdered sugar heart on cupcake “cap”. Once heart is completed, add the cap back to the cupcake; add pearls. 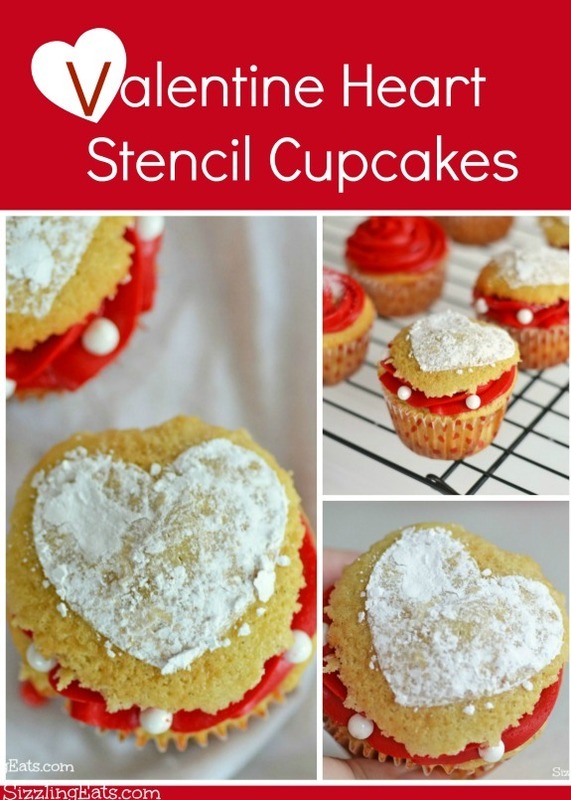 I hope you all enjoy this Valentine’s Day Heart Stencil Cupcake recipe with your family! 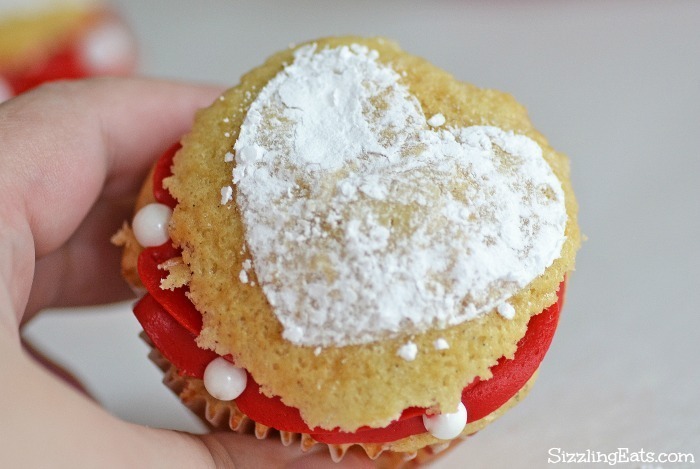 An easy to make, festive Valentine's heart stencil cupcake DIY. Pipe on frosting using a large star tip. 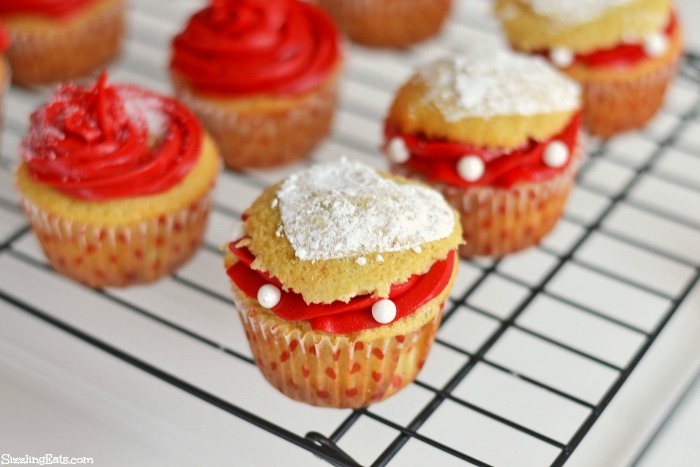 Stencil powdered sugar heart on cupcake "cap". Once heart is completed, add the cap back to the cupcake; add pearls. 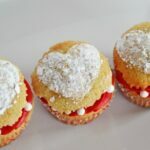 I hope you all enjoy this Valentine's Day Heart Stencil Cupcake recipe with your family! These are so cute! I love the little heart topper. Adorable! This would be perfect for newbie bakers who aren’t so savvy with piping bags and tips. Cute idea for the holiday! This would be the perfect treat for a children’s Valentine’s Day party. They’re just the cutest! I love these trendy cupcakes with the pretty heart on top. I want to try to make these for my son’s class. These cupcakes are just adorable! What a cute idea for Valentine’s Day. I love seeing the things that people can come up with. I also love cupcakes, so this is a good thing! Oh my. These are so cute. I love it! I bet my daughter and her little friends would love them, too. Such a cute treat! Love how it turned out! I’d love to make these and bring them to a Valentines party! What a cute and adorable touch, I love these. Looks yummy too, printing off the recipe. I need to try these! These are adorable. I will definitely be trying this delicious looking recipe or Valentine’s day. These would be great for any time of the year. I love the hearts. They look delicious. how “sweet” are these! my daughter would love it i made these for her preschool class. i’m going to pin this!